See Anjali Taneja, a med student and former Mutiny DJ, on some of Dinesh D'Souza's dishonest comments on the subject of Reagan's AIDS policies. 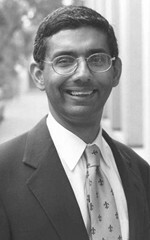 It is not only D'Souza's cultural comment that is flawed. His economic essays are full of inappropriate analogies from the earliest days of the industrial revolution. Statements like "Dairy farmers in the English countryside did such and such when attempting to gain market share. Today it's the same when ADM and Joe's Produce compete. What a bunch of nonsense.